Gift Cards UNIVERSAL - Performance Auto Parts - Car and Truck Accessories | JM Auto Racing - Intensify Your Ride! 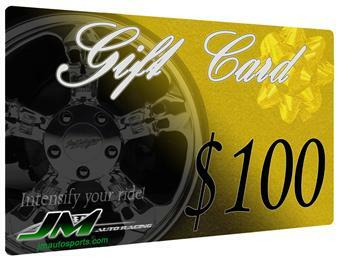 Whether it’s a holiday gift, birthday present, or a gift to celebrate a special occasion, JM Auto Racing Gift Cards are the perfect and the easiest way to show your appreciation to your friends or beloved ones. Even if you’re not sure what color is right and which accessory will perform better, you can treat anyone with a gift card and let them choose what they need and what they like best. Available in several denominations from $10 to $100, the cards are easy to order, too. You just pick the design, add your value, and that is it – the perfect gift for your special someone is on its way.